I can’t believe that it’s December, let alone the fact that winter is almost here (officially). The rain has finally arrived making the mornings a little crazy as you can barely see down the street thanks to the thick Tule fog! It is at this time of the day that the girls and I usually head out on our walks, but just like exercise is a necessity for a happy healthy life, so is lookin’ good! 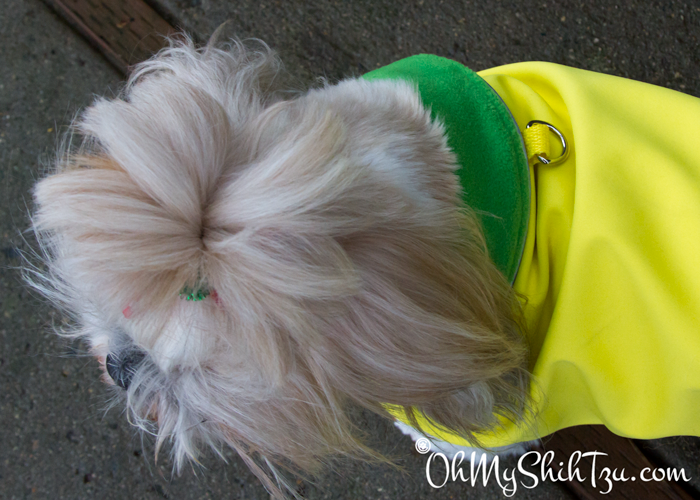 I like to keep the girls comfortable on our walks so I needed to find a jacket that was both light weight and added great protection from the wet (foggy) and cold (evenings) weather. So the great folks at Gold Paw Series sent me an Astoria Overcoat to try. Made in the USA! – I LOVE this! I think this so wonderful about the Gold Paw Series Company. Made with 25% recycled Polyester – Gold Paw Series is conscience about its impact on the Earth. Stretchy without loosing shape, which means it’s also ohhh so soft. Great detail with quality stitching. To buy or learn more about the Astoria Overcoat, check out Gold Paw Series. 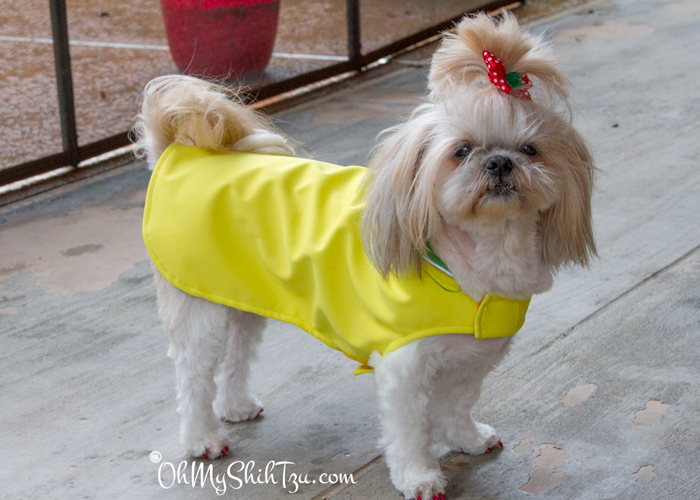 Gold Paw Series also has a great video Fit Guide on measuring your Shih Tzu for a proper fit of their clothing line. Katie the Shih Tzu (model) , who is approximately 14 pounds, slim and normally wears a baggy medium in off the shelf wear, wore a size 14 comfortably, allowing for layering of fleece or other clothing underneath. Riley would definitely need a size 16 as she weighs in at 18 pounds and is a bit of a bigger girl with an athletic build. So if you are looking for a nice winter/spring coat that you are able to easily layer with fleece, I would totally recommend the Astoria Overcoat! Disclaimer: We would like to thank Gold Paw Series for providing Katie with an Astoria Overcoat. There was no monetary compensation for this post. All opinions are that of Oh My Shih Tzu. We share information we feel is relevant and of importance to our readers. 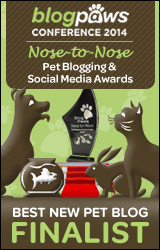 Gold Paw Series is not responsible for the content of this article. It sounds like it would be relatively light too. I know my dogs object to any coat that feels too heavy on their backs. The d-ring leash attachment sounds like a good idea as well. So cute! Love the new style of your blog! Rachel Sheppard recently posted…Rooney’s Pick of the Week: RUHA Collars Giveaway! She looks adorable in her new coat! I wondered if the d ring is sturdy enough, but it looks like it is! That’s a really nice looking coat. Harley’s only worn a sweater and that was last year when the arctic blast came and never left. Love the color selection too!